After a certain number of encounters with rabid fans blurring the line between reality and fantasy, it becomes necessary to set the record straight. The man who played James Tiberius Kirk is right; he is not a hero, but an actor. Every culture has its real heroes, persons of Valor. Thankfully, it is not contained to the battlefield, but manifests itself in forms of service to humanity, desire to bring alleviation of suffering, an impulse to educate and extend understanding, and proficiency in demonstrating brotherly love. The role models of Valor are out there, easily enough found, if people would take their eyes off the movie screen for a moment. It is not Shelly Winter swimming through the hull of the ship in Poseidon Adventure, nor the Rock fighting a skyscraper on fire, it is the medical aid worker from UNICEF battling Ebola while under threat of being shot by ignorant youth. Heroism does not emerge from happenstance or good intent. Heroism emerges from good principles enacted during a crisis. There are “everyday heroes” who step up in an emergency to save a cat, a burning home, a child. These deserve the accolades they receive, for they have done a heroic deed. Then, there is Valor. Valor is heroism squared; it requires a much higher degree of training, a higher degree of personal sacrifice, and results in an action with profound consequences. Please do not read this article as an attempt to draw equivalency between persons acting out of Valor and designing a speaker! 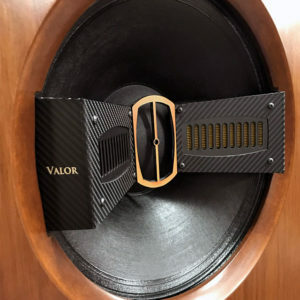 However, the product I am reviewing is named, Valor, so the question is begged, just what constitutes a heroic speaker, and how does such a speaker arise? It might be most accurate to see the name Valor as an expression of the principles of Legacy Audio. Bill Dudleston, owner and the designer of the Valor shared, “It’s about remaining undaunted in a sincere quest for restoring naturalness. As a pioneering company, we don’t wait for what we know to be correct to become accepted generally by mainstream audio.” Notice the word selection, “undaunted…quest…pioneering,” descriptors of a company that is not satisfied with status quo and will take extreme measures to move toward realization of its ideals. Valor did not arise from following well-worn design principles, but rather attempting to rewrite the book on how a superior transducer operates. 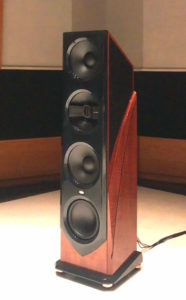 Bill Dudleston is highly trained as an acoustician and electronics designer, has devoted inordinate time and personal resources at Legacy Audio to development of the Valor and its accompanying Stereo Unfold technology, and the result is a heroic speaker that goes above and beyond expectations of audiophiles. The title of a short video on the Legacy Audio website is “Building A Legacy”; it is well worth viewing by prospective customers. Legacy Audio has been a favorite of mine for nearly the duration of my 12-year reviewing career. It is the brand of speakers that I have most consistently reviewed and owned. Circumstantially, the company has grown alongside me as I have grown in reviewing. I started out reviewing the FocusHD and Focus SE, a fairly impressive moderately priced floor stander, graduated to the penultimate Whisper (which became a test bed for internal wiring and caps; see Legacy Audio Whisper Clarity Edition), added the XTREME XD Subwoofer, and have marched up the line of the flagship models, the Helix, V, and now Valor. As I have innovated in system building, Legacy has innovated in speaker design. Legacy Audio’s strengths have played to my interests in building systems. I enjoy very large scale, impressively dynamic, highly nuanced and refined sound, which are abundant in Legacy designs. My pursuit of an ultimate experience has been dauntless as well, involving inordinate amounts of time, relentless recombining of gear, prodigious numbers of articles – so that I can get my hands on as much gear as possible to learn what works and what does not. As Legacy Audio has been the most consistently used speaker brand in my listening room, perhaps it is not surprising that coincidentally truly “breakthrough” phenomena many years in the making have been realized independently by Legacy and I. Legacy has created the Stereo Unfold Technology, and I have developed the Schroeder Method of Interconnect Placement. Much time will be spent here discussing the Stereo Unfold Technology (SUT). My discovery is not the focus of this article, so I direct interested parties at their leisure to see my seminal article here at Dagogo.com https://www.dagogo.com/audio-blast-schroeder-method-interconnect-placement/ I am fully aware that my invention, unlike SUT, appears to be a fool’s errand. But I will not be embarrassed about a method that produces such an amazingly fine result. I will comment later in the article on it briefly as I am using it with the Valor Speaker System. As I grew up in the Midwest U.S.A., I recall how delighted I was to discover a significant (now very important) speaker manufacturer in Illinois. Something about reviewing a product made in the heartland of the country made Legacy Audio products even more appealing. From my initial contacts with Bill Dudleston, Chief Designer and owner, I knew that Legacy products would be very high quality, and over the past decade that quality has never flagged. There have been few persons in the audio industry better equipped to discuss with me the nuances of speaker design than Bill. He has a thick portfolio of work in the Pro sound industry as well as domestic. He is among the most knowledgeable in the audiophile industry in regards to aspects of performance touching upon speaker design and construction, as well as psychoacoustics and audio wave reconstruction. I brought out some of Bill’s background in the review of the V Speaker System, and for this article I conducted a technically oriented Interview, which is attached to this article for your edification and enjoyment. To give you an idea of how much time is spent on a review such as this, and how much assistance in understanding Legacy Audio products Bill disseminates, that portion of this work alone is 12 pages. It might be understandable, then, that I will not be regurgitating the contents of that Interview, but will discuss what I feel are pertinent aspects, and I invite interested parties to delve more deeply into the design elements of Valor. Legacy has also blossomed under the influence of Bill’s daughter, Victoria, who several years ago joined Legacy and uses her degree in marketing for the company. Since then Legacy’s customer interactivity and excellence across all aspects from Ads to customer service have been elevated. Show attendees at AXPONA are treated to one of the most action packed speaker manufacturer’s rooms and a staff from Legacy that is unfailingly welcoming. I always look for them in one of the larger ballrooms, usually on the ground floor. Speaking of heroism, it was no small feat of courage to move the 288 pound per side Valor speakers down my stairs to nestle them into the basement listening room. Gratefully, Legacy Audio sent over Landon, who is built like a linebacker, and Brice Auxier, Legacy’s Technologist. Between the three of us we were able to bring the speakers down in a thoroughly controlled fashion. I do not recommend attempting to move these speakers with less than three persons, though Brice has a tale of an impossible installation situation involving him and two recruited bystanders moving the Valor speakers up several flights of stairs. This newest flagship speaker tipped the scales at about 60 pounds more per channel than the Whisper speakers previously reviewed. Legacy certainly does not shrink back from making big speakers! On the Pro side of the company’s products is the Double Helix at 62”x 36” x 18” and a whopping 350 pounds per side! I’m content to limit my reviews to the domestic products. Brice, who was trained by Bill, took about an hour of calibration to carefully set up the Valor with my first combination of gear employing the Benchmark Audio AHB2 Amplifier. In the initial setup the Legacy installer hooks up the Valor system’s Wavelet control center to a laptop and assesses filters (crossover settings) for the speaker system. The typical installation program available to the owner is accessed from the Legacy (software) Remote Control, and the results are shown in a “behind the scenes” fashion to the installer. Brice was encountering anomalies with the Benchmark Amp, as it is a Pro-oriented amplifier and has three Gain settings on the back. I had previously used the amp at a lower gain setting and when the sweep was run with the microphone to calibrate the Valor the output of the speaker was insufficient for the complex computations to finalize. Brice said there was not enough output. I pointed out the Gain switch on the AHB2, and we set it to the highest output. That resolved the issue and the computations for the Valor finalized perfectly. In fact, as the speaker system was in a custom room built specifically for two-channel audio, Brice noted that he had never seen a more perfect result displayed in the graphs during setup. The heroic measures, and trust me they were heroic, when I built the room were affirmed in the quality of the room’s interaction with the VALOR Valor System. I also covered the features and operations of the Wavelet in the previous review of the V, so I will not recount them here. A return to use of the Wavelet in this review deepened my respect for the technology, and its user-friendly interface. In addition, my colleague Ed Momkus wrote his impressions of the Wavelet in his assessment of it in his system, which does not use Legacy Audio speakers – the point being that the Wavelet is suitable for broad application. The operations of the Wavelet seem largely unchanged in the two years since I used it with the V System. The behind the scenes functions that command the driver sets by necessity are different between the V and the Valor, but the user experience is nearly identical. Legacy offers superb customer support and has its network of trained personnel, most of whom are dealers, to provide setup and support of the system. In order to do so, the owner must have an Internet connection for the Wavelet, which is necessary for the Valor speakers to function. One of the special aspects of the Wavelet is its extreme flexibility, offering a full suite of adjustments and inputs to accommodate nearly any mix of analogue or digital source and amplification, as well as a wide range of amplifiers. I was a bit surprised to see that the recommended minimum amplification for the Valor has risen to 60wpc, versus the V’s at 30wpc. However, the treble (top) end of the speaker that is driven by the outboard amp is more sensitive than the V. According to Bill, even at modest listening levels the dynamic crests are higher with the Valor than the V.
However, that does not indicate less power is recommended! Consistently, and keeping the relative ratio of power to efficiency of speakers, I find that higher clean power means better sound quality. All other things equal, I will normally prefer a 60-watt amp to a 30-watt amp. I have found through the years that if I can pair equipment (i.e. source, cables) with the Legacy Audio products the results will be more impressive with higher power. This should not be surprising, as it held true not only with Legacy, but also with other dynamic speakers such as the Vapor Audio Joule White and panel speakers such as the Magnepan .7 and the Kingsound King III electrostatic speaker. I didn’t immediately see any changes to the Legacy remote control software (in my room the software remote is loaded onto a Samsung Tablet S3 and runs in conjunction with ROON). This is an intuitive, extensive remote that offers enough control to the user without overwhelming the novice with background functions. It strikes me as the perfect tool to allow the owner precise setup without having to know technical aspects of the speaker’s performance. It is user-friendly and calibrated finely enough to finesse the performance of the speaker in real time. Even a system recalibration is not a daunting experience when a new source or amp is introduced to the system, as the steps are clearly outlined in the sequential windows of the remote. I found the steps, operation and outcome of use flawless. Switching out an amp to drive the upper end of the Valor was quite easy with the Wavelet. Once the alternative amp was placed, running through the steps to have the channel sweeps (requiring the microphone set up at 4 feet and aimed directly at the coaxial driver, in line with the respective ear) was intuitive and finalized quickly. In under an hour I had the new amp operating. No one should be put off by the idea of being a slave to a particular amplifier; the Wavelet makes it easy to upgrade at will. I continue to advocate revisiting power and interconnect cabling associated with the amplifier change. These globally influence the Valor’s sound and should not be ignored. As prodigious a transducer as the Valor, it still is subject to the same influences in a system as other speakers – amps and cables make a palpable difference. I spend a considerable amount of time in reviews setting up systems, for this is the only way to gain extensive experience with equipment. The Valor went through several iterations of gear including both amplifiers and cabling. The source, a two box solution also reviewed and given ever growing endorsement from myself based on superlative performance, the Small Green Computer sonicTransporter i7 4T AP and the SONORE Signature Rendu SE, remained constant throughout the review. Testing my own powers of strength, I rotated in big speakers – the Whispers, the King Sound King III electrostatic, the Vapor Audio Joule White (Which is 270 pounds, but two modules, and which I wisely have on casters) – to conduct relative performance comparisons. I had to remain focused on the physical task, as the center of gravity of the Valor is high and the handles of the furniture dolly also had to remain nearly at shoulder height – and I am 6 5” tall. Dropping much below the balancing point would mean a load shift and the calamity of the speaker dropping to the floor. There was no way I could individually lift a nearly 300-pound speaker and 40+ pound hand truck, much less keep it from crashing to the floor. While muscling it across the thick Berber carpet with underlay I asked myself more than once, “Is this really necessary?” Absolutely, if the goal is to have real world comparisons versus “impressions” based on foggy, more distant use, even if in the same room. The impressions you read about speakers, whether 10 Kilos or 110 Kilos, are from relentless setup of systems and notes taken as I sit in front of them, not from recall. One aspect of the Wavelet’s performance was markedly superior to previous experience; the computations for room correction, which are done remotely on the Net, were quicker in every case than when setting up the V two years ago. The more time I spend with the Valor, the less I want to set up the other speaker systems, and that is not because of its weight! The Whisper, King III, and Joule White are all exceptional speakers, but as might be expected Valor outclasses them, not just in terms of sonic quality and beauty, but in sheer adaptability to cinch down the rig in precisely the manner of performance I desire. The Wavelet and the software Remote are the powerful command center of the system, and an intoxicatingly enjoyable tool that when combined with music interface software like ROON makes the owner feel nearly omnipotent as an audiophile. Why on earth did I spend an hour watching Jujitsu matches on YouTube the other evening? I have never done so previously, and perhaps never will again. Perhaps unconsciously I was thinking of how to present the advantages of the Valor in light of the effusive review I wrote for the V previously. Prior to my becoming one, I remember how I would guffaw at reviewers who wrote glowing articles about a speaker, only to trump themselves with the next iteration from the company. I used to think, “What a crock of …,” because in my ignorance I thought it couldn’t get that much better. I was foolish and inexperienced back then, so I didn’t trust the reviewers, and didn’t know that it can get more than that much better! Frankly, it gets better than you can imagine, particularly with the Valor. When I wrote the review of the V Speaker System and Wavelet, I scoured the dictionary for words that began with the letter v as a theme for each segment of the article. I used Vesuvius, variegated, virtuoso, voluminous, vector, versatile, variable, voltage, vigorous, va-va-voom, veracity, ctrl+v, vetting, and victorious. Legacy found one that I missed, Valor, and it is most fitting for this speaker. Here I commence in earnest building of accolade upon accolade, and it is completely justified because the performance of the Valor is completely superior to the V. Alexander Graham Bell realized the horrifying reality that ships and infantry were no match for airplanes. It’s that kind of technological disparity between Valor and conventional speakers, and even the V Speaker System falls short in significant aspects of performance. Part of Valor’s superiority lies in a remake of the speaker in the fundamental aspects of performance. That in part is where Bill Dudleston and Legacy Audio get heroic. Rather than merely revising the V, the Valor is a complete reconfiguration, and introduction of a new processing software and hardware collectively called Stereo Unfold Technology. About the only aspects of the speaker that retain their identity from the V are that it’s huge, uses the post-convergent array AMT (tweeters), has huge woofers and subs built in, and is coordinated by the Wavelet. What is different? Nearly everything else. The first time I laid eyes on the Valor I was surprised at how different it was from its progenitor, the V. They share little in resemblance, at least in terms of the front baffle. They are perhaps most alike in terms of their shared operational characteristics. Three aspects of the V developed more fully in the Valor are the Post Convergent Array, the substantially larger midrange drivers, and the configuration of the built-in active subwoofer. 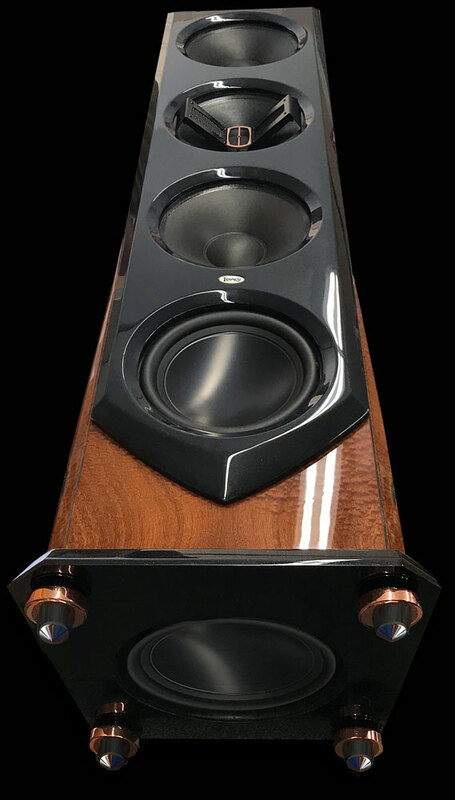 In the V, the post convergent array stands individually as a separate driver set complemented by a pair of 6-inch curvilinear midrange drivers in a dipole array. Two of the 14-inch mid-woofers are used, but there is no attempt to form a concentric driver with them. Finally, the size, number, orientation and power for the bass and subwoofer is changed from the V to the Valor. Consolidating the treble and midrange drivers to a coaxial design; a 1.5” midrange waveguide sits inside the middle of three 14” drivers; that one a mid-bass driver. 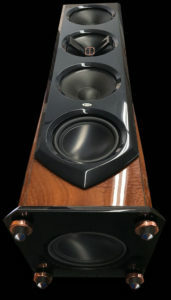 Thus, it forms a full range concentric set of drivers reinforced in the low end by flanking upper and lower 14” woofers. Several innovations come together in this design, including the titanium/polyester diaphragm of the 1.5” coaxial midrange, enormous curvilinear cones, the AMT 4” post convergent array, and an oversized, “super cardioid array” encompassing three 14” drivers. The middle of three 14” mid-woofers has arching over it a dual 4” AMT “bridge mounted” tweeter set in post convergent array. Reorientation of the bass/mid-woofer driver/midrange drivers; The lower frequency range of the new 1/5” concentric midrange allows elimination of the 6” midrange drivers found in the V. Consequently a 14” driver handles mid-woofer duties and the two additional 14” drivers are for bass. The transition between the 1.5” coaxial driver and the 14” mid-woofer means both a smoother frequency response and a more easeful, yet prodigious midrange. The 14” bass drivers above and below the coaxial array put this configuration into a “super cardioid array”, making this huge speaker image like an enormous monitor. I still enjoy the Legacy Whisper DSW Clarity Edition, the ramped up version of the popular speaker that is still in production. Bill was at the time utilizing a quasi-line source method by grouping a quad of 6” mid-bass drivers surrounding a 4” and 1” set of ribbon drivers. Switching out the Valor (no easy feat!) for the Whisper took some adjusting, as the pinpoint imaging of the Valor was swapped for a group of drivers, and the lower coherence was immediately noticeable. Like a full range driver that acts as a point source, the Valor’s coaxial driver eliminates the vagaries of a speaker having multiple midrange drivers. The 12” bass driver of the V is removed, replaced by the triple 14” drivers. A single forward firing subwoofer is complemented by another underneath. The more square inches of cone surface in general the more ease there will be perceived at any given frequency. The three 14” bass drivers and twin 12” subwoofers allow dare I say a gentle, yet commanding presence. To replicate that kind of power with finesse while using my Whisper speakers I have to add a pair of Legacy XTREME XD Subwoofers, bringing the total of 15” drivers employed to a Yet, the Valor has superior refinement, as it requires fewer drivers. A substantial shift upward in power is noted. Whereas the V provided 1,500 Watts for the bass and subwoofer, and necessitated four channels of outboard amplification, the Valor provides 2,750 Watts per side (1,000 for the subs, 750 for the bass, 500 for the mids and 500 for the Stereo Unfold (ambient) array. These driver groupings are more consistently powered than if the owner supplied outboard power. The use of internal PowerBloc amplification assures there is no mismatch in powering the bass and subwoofer. Stereo Unfold array: Bill’s genius in regard to applying the Stereo Unfold Technology was moving the function of expanding the waveform from the front baffle to the outside and the rear of the speaker. This is accomplished through three drivers distributed to the upper sides and back of the speaker. In that way a pristine primary wave launch could be obtained while expanding it in a very controlled fashion beyond the speakers themselves. The result is a finer central anatomy of the soundstage, with a center image unmarred by ancillary drivers firing forward. The effect caused by the Stereo Unfold function reminds me of the BMC PureVox Speaker that I reviewed a few years ago. A second driver set mirrored the front, but was housed in the speaker’s angled top, pointed toward the head wall. I enjoyed experimenting with this design by turning it around, using it an unorthodox placement wherein the angled driver set was primary and the formerly forward set was now firing toward the head wall! Turned around in such fashion, the PureVox did a fairly convincing imitation of an omnidirectional speaker. It showed me the influence of drivers firing off the primary axis. In similar fashion, the ambience array drivers of the Valor firing off the primary axis explode the soundstage, opening it up significantly. Just one of these changes would render a distinct alteration in sound and would be reason enough to produce a new flagship. Instead, the redesign is heroic, the equivalent of acoustically dismembering the V and vivifying it in a reconstituted form. Distinctions present themselves readily when comparing the V to the Valor. (Frankly, typical passive speakers of nearly any size don’t compare easily, as they have no active ambience circuit. The V is about as close as one will get to the Valor in terms of operation) The V’s top end is more closed in, or shall we say “pinched” than the Valor. If you have compared a reticent soft-dome tweeter with a more floral ribbon tweeter, then you will understand my point. Though we tend not to think of the treble response as being informationally robust, it is. However, the tweeter and crossover either enable or hinder the full expression of the signal. Only comparatively the V’s tweeters disable the full expression of the treble. That is because the Valor adds a game changing horn-like waveguide that shatters the sky of the treble ceiling and opens it up with superior information retrieval and extension, not to mention dynamics. A musical example will make this clear; cymbal strikes as heard through the V have the requisite impact, resonance, shimmer and decay. However, the Valor renders them with more of it all, and with a distinct sense that the cymbal has thickness, weight, and more extensive propagation. Take that effect and extend it to encompass the entire band (performance) and the result that the mind considers more truthful. The Valor retains a paring of midrange drivers, and as with other speakers like the Vapor Audio Nimbus White the lack of a point source is noticeable. As tempting as the fullness of a dual midrange is, it is splayed. Moving to the single 6-inch Accuton midrange in the Vapor Joule White resulted in imaging being pulled inward like a gravitational field drawing in particles. I do not recall hearing so finely accomplished a concentric driver with pinpoint imaging in such a large multi-driver speaker as the Valor. Wait; the biggest of the Avant Guard horn speakers I recall doing the same. Whereas you need a mansion and about $100K additional to get that result, the Valor lets you have it in a normal sized home and for much less. Speaking of horn speaker sound, the V never mimicked the pinpoint propagation of a horn’s concentric driver, but the Valor does. The post-convergent array of the 4-inch NeoRibbon drivers do not allow for a sloppy result. Dare I say the concentric 14” resolves the informational landscape between the speakers realistically, while the array of Stereo Unfold drivers propelling their signal outwards renders the wider, peripheral imaging cleanly. Just as whatever is in our eyes’ focus is clear, while the periphery is softened, so also the space between the Valor’s towers is clear, while the periphery is less distinct. That is perfectly ok, as our hearing discerns the immediate effect and subjugates the secondary stimuli. The outcome of all this is that the Valor is distinctively different than most flagship speakers. Yet, it retains the house sound, due to the influence of Bill, such that it repackages the performance, while still sounding familiar. Bill’s bravery, yes, fearlessness in conceptually ripping apart the speaker and reanimating it has resulted in breakthroughs on the highest level. I’ve only read about half-way through the article, but as I must work, I must also take a moment to compliment. The author’s opening including UNICEF is Golden. He didn’t preach. He didn’t rant on a diatribe. He placed a sensible idea, more or less briefly, in a spot for a reader to pick up or leave there while perfectly focusing on the experience with Valor. While not quite my preferred Herb Reichertesque or Art Dudleyesque writing, I hope Mr. Schroeder will continue to write, and I will continue to enjoy his work. I wish you success, happiness, and love. KUDOS!